Republican Greg Gianforte, fresh off his assault charge, won his special election tonight to become Montana’s lone member of the House. This was the predicted outcome as of a few days ago. Montana is a red state and even the Democratic Party didn’t seem to have high hopes for a victory. After all, they haven’t chosen a Democrat for the House seat in two decades. After Gianforte assaulted a reporter last night, there was hope among liberals that he might lose, but since most of the votes were already cast through early voting, that was still a long-shot. If there’s any consolation, it’s that the Democrat, Rob Quist, lost by under 10%. If that could happen in Montana, what’s going to happen in states that are much more moderate? Still, for now, it’s disappointing. 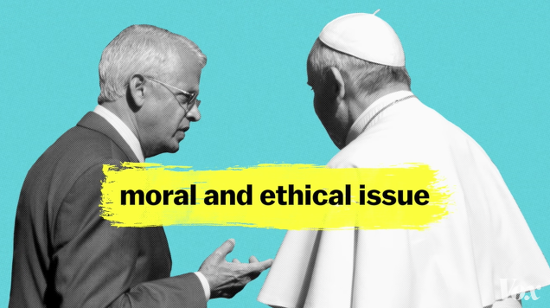 Gianforte, you might recall, is a Christian whose family foundation has donated money to the Glendive Dinosaur and Fossil Museum, a local Creation museum. A couple of years ago, students at Montana Tech even protested the fact he was delivering the engineering school’s commencement address because he didn’t accept science. He’s the type of candidate who wanted schools to “teach the controversy” in science class even where no controversy exists (at least among people who actually know what they’re talking about). MAUK: Your position on evolution has come up in past campaigns because of your support, primarily, of the Glendive museum. Do you personally believe in evolution? 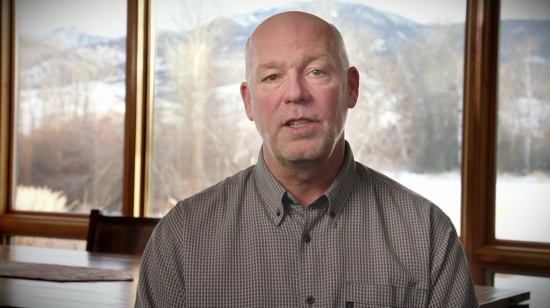 GIANFORTE: I personally believe, as many Montanans do, that God created the Earth. MAUK: But do you believe, personally, in evolution? GIANFORTE: I believe that God created the Earth. I wasn’t there, I don’t know how long it took. I don’t know how he did it exactly. But I look around me at the grandeur in this state and I believe that God created the Earth. MAUK: And so evolution is not something that you believe in? GIANFORTE: Um, I think I’ve answered your question. The better follow-up question would’ve been, “How long do you think it took God to create the Earth?” Gianforte puts that number in the thousands of years — going completely against every bit of scientific evidence we have available to us. He even uses the Ken Ham excuse of “I wasn’t there” to argue that he can’t be expected to answer the question, as if all evidence is unreliable. This is the man who will now be in Congress. Another Republican embarrassment. Another Donald Trump lapdog. Another conservative who rejects science and LGBT rights and women’s rights. Another Congressman who’s perfectly happy taking health care away from poor people. 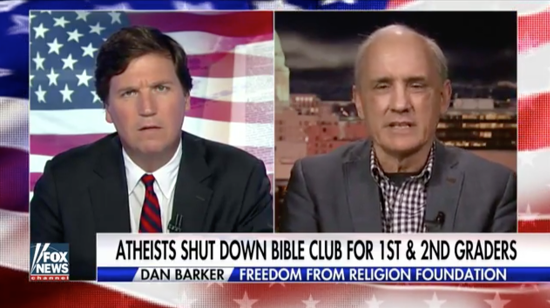 May 26, 2017 Tucker Carlson Didn't Like Atheist Dan Barker Denouncing the Bible's "Brutal Alpha-God"